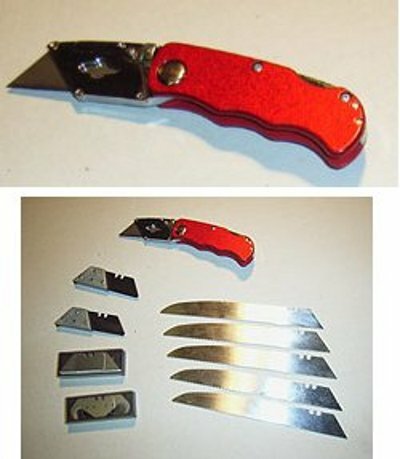 Folding knife is a DIY knife, saw, carpet knife and glass cutter all in one package, something you will be thrilled with. Out tumbles this dinky red knife and packets with 47 blades. The value and usefulness is astounding. There you have 20 regular blades, in a box, the sort of sharp DIY craft knife blades you need on every project. Here you have five saw blades, you will love them when tree pruning, cutting rope, sizing plasterboard and more. Then 20 hooked blades are noticed, use them as a carpet knife, cutting the material while protecting your underlay or flooring, use them while paint stripping from delicate mouldings. Discovery is made of two glass cutting blades, use them like a glass wheel to score cut glass and tiles. You probably know how much DIY craft knives, saws, carpet knives, specialist paint stripping tools, and glass cutters are. The folding knife does it all and would make a terrific gift to yourself or anyone handy. Folding Knife text, images and video are copyright.